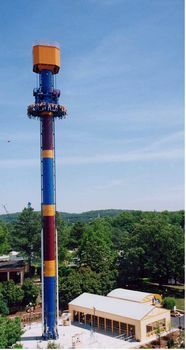 Acrophobia is an excellent drop tower in Peachtree Square and one of the best attractions at Six Flags Over Georgia. The minimum height to ride is 52 inches. An Intamin Gyro Drop tower. Guests ride up the tower slowly, while spinning. Guests are forced to look down when the seats tilt out. A ride op typically sings a song to provide music(The itsy bitsy spider... or another song to set riders on edge) during the long pause at the top. Guests are then dropped, ending the short ride.